This post is sponsored by iHerb, one of the world’s largest online suppliers of natural products. All opinions are my own. 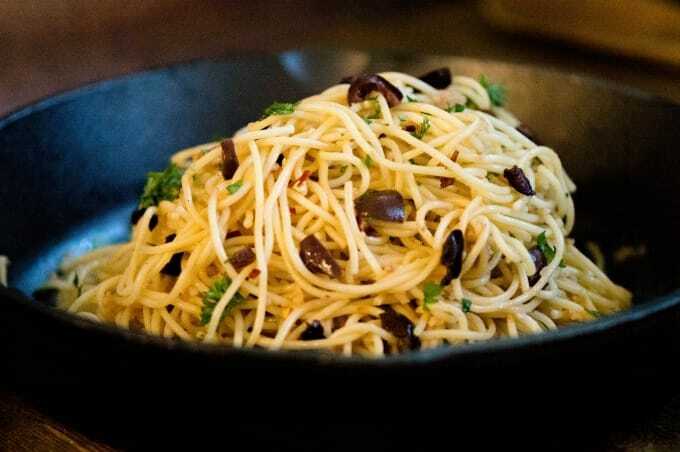 Late Night Pasta is the meal you didn’t know you’ve been craving. Whether you’ve been out with friends, up late watching Netflix, or just have a case of the midnight munchies, the bold flavor of this easy 15-minute dish will delight. I was nine years old, maybe ten, when my Aunt June made Late Night Pasta for me. I was staying at my grandmother’s for a few nights and my aunt, whom I’d never spent much time with at that point, was there as well. She was quite a character – vivacious, larger than life, the exact kind of glamorous relative to enthrall an otherwise lonely kid. She let me stay up later than I ever had before, and when my stomach started growling in the wee hours of the night, she made me a pasta dish I spent the next two decades trying to duplicate. My aunt’s version involved a little bacon, some onion, and some chopped green olives — whatever she found in Grandma’s old Frigidaire that wouldn’t be missed the next day. It was still the most exotic meal this kid — who was raised on canned spaghetti and mushy mac and cheese — ever eaten. 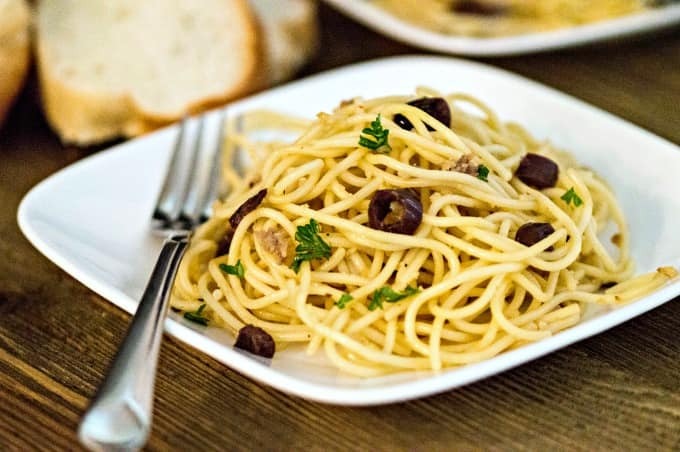 Years later, I’d learn her recipe was a cross between pasta carbonara and spaghetti Aglio e Olio (spaghetti with garlic and oil), but I’d long since taken to calling it Late Night Pasta. 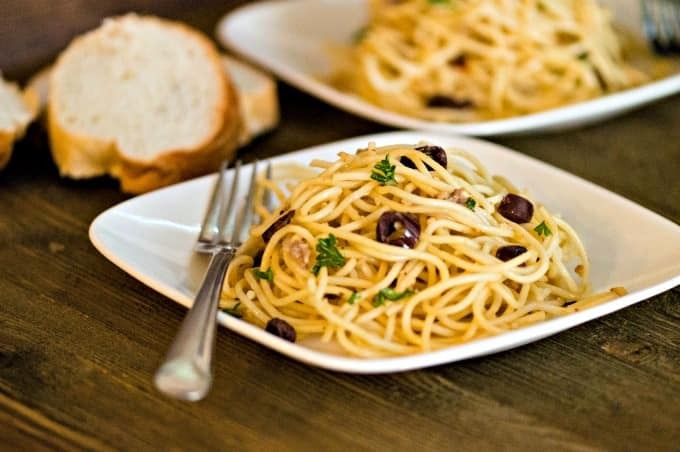 The first time I made this version of Late Night Pasta – using anchovies, bread crumbs, and Kalamata olives — was back when my husband and I were dating. We’d just gone fishing together for the first time, an excursion that proved to be trying for us both. Oh, I’d been fishing often before – I enjoy it quite a bit – but, to me, fishing had always meant sitting or standing in a shady spot on the river bank and casting where the fish were biting. For him, it meant continually trawling in the center of a lake while sitting in what seemed like an extraordinarily loud boat and roasting under the sun as we breathed in choking exhaust fumes. So, after what seemed then like the longest day of my life, we came home sunburned, grumpy, and without having caught one single fish. Surprisingly, we were still speaking to each other, though, and one of the first things we said after walking into my apartment was that we were both famished. Neither one of us wanted to go back out to get food and, to be perfectly honest, we were both in dire need of showers, anyway. Being a gentleman, he let me shower first then, while he washed up, I rummaged the pantry to figure out what I could make. The result was this Late Night Pasta, a meal which we enjoyed that evening as well as many others over the next eighteen years. So, the other day when our seventeen-year-old son came home very late and “absolutely starving” after a long day of helping friends build a deck, I knew just what to feed him. Like his father and I were on the day I first made Late Night Pasta, he was sunburned and sore, too. Now, I don’t know about you, but I can’t enjoy a meal if I’m physically uncomfortable so I ran him a tub and suggested he soak his sore muscles for a while before I made dinner. Thankfully, I’d just received a shipment from iHerb containing high-quality Dead Sea salt and 99% aloe vera gel which I knew would both provide him with enormous relief. If you’re not familiar with iHerb you really do need to check them out. A trusted Google store with a team that provides support in 10 different languages, they carry over 35,000 products and ship to 160 countries. In addition to carrying a wide array of nutritional and herbal supplements, they stock everything from breastfeeding supplies to all-natural non-toxic household cleaners and all of the ingredients you need to make Late Night Pasta, too! I have to admit; I was amazed by their selection of kitchen staples. As someone who spends a lot of time and effort sourcing high-quality organic ingredients, finding them all on one website for great prices feels like a major victory. With free shipping on orders over $20, it was such a treat to stock up on household necessities while also replenishing my pantry. Be sure you’ve got some garlic and fresh parsley on hand, too! A delicious 15-minute dinner full of bold flavors to satisfy those midnight munchies. Bring 3 quarts of heavily salted water to boil over high heat. Add pasta, stir well, and cook until al dente - about 9 minutes. Stir in the olives and garlic and cook for 1-2 more minutes until garlic is fragrant but not brown. Stir in parsley and remove from heat. Drain the pasta and add it to the anchovy sauce in the skillet. Toss well to coat all of the noodles. Transfer to plates and garnish with grated parmesan cheese if desired. 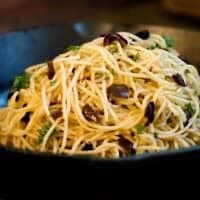 Let me tell you, when my son finally got out of the tub where he’d soaked until the water grew cold, he was so thrilled to see that I had a big plate of Late Night Pasta waiting for him – and I was thrilled to learn that he loved it as much as his dad had. The family tradition continues. This post was sponsored by iHerb. All opinions are my own.